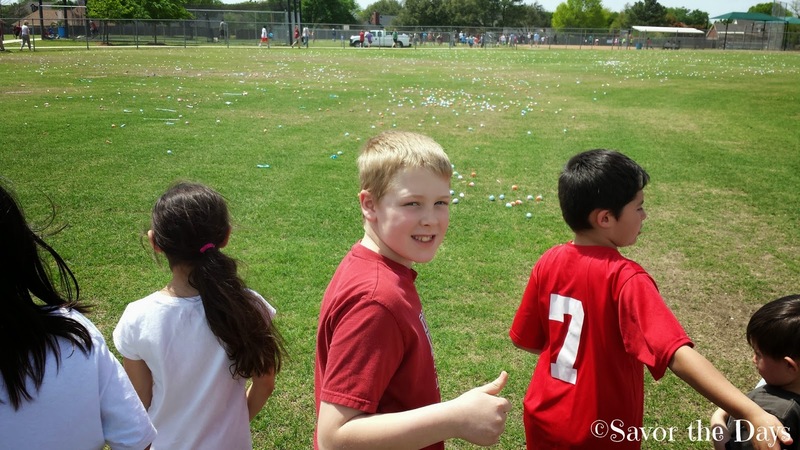 We had fun at the Flower Mound Easter Egg Scramble. They don't hide the eggs and candy. They just throw it out on a field and let the kids race for it so it is called a Scramble instead of a hunt! The kids were divided up by age groups. I took Rachel to the field for ages 5-6 while Stuart took Nicholas to the field for ages 7-9. The kids were all packed in at the gate waiting to be let loose on the field. While we waited for all the eggs to be placed, I tried to get a picture of Rachel. She just whined and said, "Come on Mom! There will be plenty of time for pictures after I get the candy!" The kids were let loose! There was loose candy scattered all over along with some plastic eggs that contained either candy or a ticket to claim a special prize! ...but most importantly she had lots of fun! After the egg scramble, we headed to the bounce houses to wait to meet up with the boys. Stuart caught some pics of Nicholas at his scramble. Here he is ready to go. He got tons of eggs and candy too. A short while after the kids finished their egg scrambles, there was actually another scramble that was just for the adults. Stuart and I both participated. It was actually fun and it was humorous watching adults trip and fall as they scrambled for eggs like silly kids. I actually got a prize ticket in one of my eggs. I went to the booth to claim my prize. I knew some of the prizes were gift certificates to local businesses so I said a little prayer to get a massage gift certificate. That didn't happen. Instead I was handed a brand spanking new...basketball. Yep, I won a basketball. So I handed it over the Nicholas and tried to roll my lip back up to my face. There was a cute little petting farm where Rachel got to hold lots of different rabbits. They were all so cute and furry! So were the baby chicks! Rachel had to snuggle each and every bunny. I just couldn't get her to leave the petting farm! She was just so happy spending time with the cute little critters! Nicholas and Stuart played with the basketball. It was neat watching them throw the ball to each other. It makes me glad to have one it and I hope they get to spend some time playing basketball together at the court at the school down the street. As I watched Nicholas play with the ball, I was overtaken at how grown up he looks. He will turn 10 years old next week. I just can't believe how quickly the time has flown by. It makes me want to savor these days with my kids even more than ever.